PDP 200 Double stacker with platform. 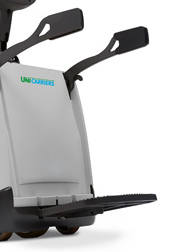 Are you interested in the UniCarriers PDP 200? Folded down at the operator's convenience, the robust operator platform features efficient damping to provide a safe and comfortable working environment during long shifts. The easily foldable protection bars protect the operator. A range of fixed operator platforms are also available as options. Lifting 1000 kg up to a height of 2,090 mm, UniCarriers's ProVision mast design with off-centre lift cylinder optimises vision and operational efficiency. 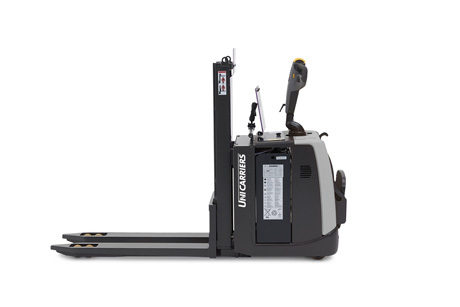 The newly developed lift cylinder contributes to superior lifting and lowering performance. Individual access via PIN code or Smart Card (optional) means that only authorised drivers can operate the truck. Operational data allows optimising fleet use. Service menu with diagnostics makes for rapid and convenient servicing. Modular design and reduced number of parts for maximum uptime.